Mice / Mats / Keyboards. PCI Cards / PCMCIA Devices. Memory Cards & USB Pen Drives. Memory - SD & SDHC. PS4 & PS3 & PS2. PSP / PSP Lite / PSP Slim. In Car DC Power & Accessories. GoPro & Action Cam Accessories. Action Cams & Dash Cams. Camera - Audio Video Cable. AV Cable - Other Brand. USB - OTHER not listed. 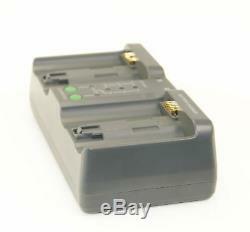 Camera Batteries - Other Makes. Lens Caps Hoods Covers Filters. Laptop / Tablet Case & Covers. 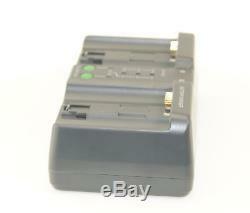 Ex-Pro Nikon MH-26 EN-EL18 Sequential Dual Fast Charger with 2 Battery Nikon D4. Dual sequential battery charger for Nikon EN-EL18 Batteries, Nikon Equivalent MH-26, compatible with Nikon D4 SLR Camera with Ex-Pro EN-EL18 Battery (x 2 Unit). Automatic Cut-Off on completion of charge, Charge indication lights, 50/80/100%. 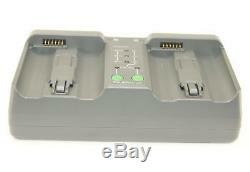 Works on 110-240v Worldwide mains operation [Ships with UK Mains plug]. Designed and Manufactured to operate like the original Nikon MH-26. Lightweight, great for travelling where weight is an issue these days. Manufactured to CE European Standards. 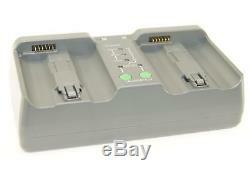 Can be used as a replacement or additional battery. Our cell's are manufactured to the highest standard meeting or exceeding the original manufacturers specification and supplied with a 2 year RTB guarantee. Ex-Pro® batteries are fully tested and built with lithium-Ion technology to ensure maximum Power and battery life with zero memory effect and low self discharge. Dimensions :- 156mm L x 85.3mm W x 50.5mm. Compatible with batteries :- Nikon EN-EL18, EN-EL18 Compatible charger :- Nikon MH-26, MH26 Compatible with the following devices :- Nikon D4 Digital SLR. What's in the Box. 1 x MH-26 Mains base charger. 1 x UK (3 Pin) Mains Plug cable. 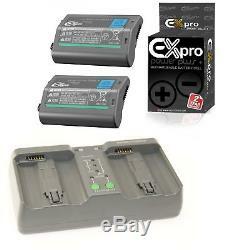 2 x Ex-Pro® Nikon EN-EL18, VFB11001 2600mAh Replacement Lithium Li-ion Digital Battery. Additional Units of this item. SORRY, Personal collection not available. Best Sellers - Lowest Prices. Lindy NC-60 HQ Active Noise Cancelling Headphones with Travel Case and Adapters. Mini Small Universal Tripod Compact Digital Camera DSLR, Cloth, SDHC Card Case. CAT Daypack 16L Rucksack Backpack Bag Travel Walking Hiking Sports School Black. Hama Star 3 Section Camera Tripod. Wireless Wifi IP Camera Webcam Baby/Pet Monitor CAM Pan Tilt UK BLACK. Hama Traveller Compact Travel Tripod 3D Pan & Tilt Head 43cm 16 Quality. Hama Classic DSLR Digital Camera Cleaning Lens Pen. Retro Vintage Black & White Flip Clock Time Desk. LINDY BNX-60 - Bluetooth Wireless Active Noise Cancelling Headphones with aptX. 10m x 6mmÂ² Professional Grade Low Resistance 770 Strand HiFi Loud Speaker Cable. Get in touch with us. The item "Ex-Pro Nikon MH-26 EN-EL18 Sequential Dual Fast Charger with 2 Battery Nikon D4" is in sale since Tuesday, August 2, 2016. 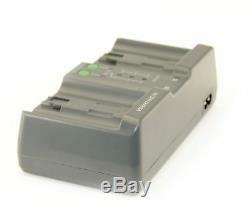 This item is in the category "Cameras & Photography\Camera & Photo Accessories\Chargers & Docks". The seller is "directcal" and is located in Cleveland. This item can be shipped worldwide.